3D Land as it appears in Smash. 3D Land (3Dランド, 3D Land) (initially called Super Mario 3D Land) is a stage in Super Smash Bros. for Nintendo 3DS and Super Smash Bros. Ultimate. The stage is based as a whole on the game Super Mario 3D Land. When unlocking him, Bowser Jr. is fought here. The stage is a travelling stage that cycles through a castle area, a valley, a downhill area, and a water area, ending in a warp pipe that restarts the cycle. The castle and downhill areas have the players moving horizontally to the right, while the valley and water area have players standing on platforms that move into the background. The ? Blocks spawn items when hit and have a higher than normal chance of spawning a Super Leaf. When first starting on the stage, players will spawn on four yellow platforms. These platforms will not spawn again on any successive cycles. In Super Smash Bros. for Nintendo 3DS, the Ω form consists only of a single platform in the water area; in front of the Skewers and final Warp Pipe. In Super Smash Bros. Ultimate, the Ω form and Battlefield form take place in the water area with a metallic structure acting as the main platform that is resized and reshaped to match Final Destination and Battlefield, respectively. The three soft platforms of the Battlefield form are metallic and are unique to this form. World 1-1 in Super Mario 3D Land. World 8-2 in Super Mario 3D Land. This stage as a whole is based on the Nintendo 3DS game Super Mario 3D Land, with each part of the level referencing levels from the game. The castle area is roughly based around World 1-1 with changes to layout of the platforms and the platforms themselves. The area is also a lot closer to Princess Peach's Castle than it was in Super Mario 3D Land. Flip Panels also appear here as platforms, though they are not pass-through, as they are in the stage. Just prior to the stage transition is a Note Block, which can bounce fighters onto the incoming platforms; this block is two blocks long, as was often the case in Super Mario 3D Land. The valley area's closest resemblance is World 8-2, in that both levels have steep rock cliffs with grass on top; however, the resemblance ends there, as the level in Super Mario 3D Land did not have moving platforms (other than ones that move in a circular pattern), or gray rocks protruding from the cliff sides. The cliff walls are also more red than they are in original game. Other than World 8-2, there are no levels that resemble the valley area. The downhill area is roughly based on World 4-1. In World 4-1, the player navigates through the level by scaling steep cliff sides with grass tops. In this stage, the design of the soil found on the smaller cliffs with grass have been retained, and the gray rock cliff walls seen in the background are designed around the taller cliff walls in World 4-1. The level also has trees with rounded tops, which were also retained in this stage. However, the end of World 4-1 was located on top of a tree-like structure perched on top of the cliff, meaning that the player is mostly going upward, unlike in this stage where the battle goes downhill. The rotating blocks area comes from World 4-3, Special 3-2, and Special 6-4. While rotating block platforms originate from World 1-5 and World 3-5 of New Super Mario Bros. Wii, the design of the blocks originate from Super Mario 3D Land. In the levels that feature the rotating blocks, the level takes place in the sky above clouds, but in this stage, they're closer to the ground. After that, various pipes can be seen, and some of them extend and retract, proving fighters higher ground. The extending pipes, despite debuting in Super Mario World, never appear in Super Mario 3D Land. The water area originates from a few different levels. The idea of players on moving platforms come from World 1-4, but the background and scenery of the stage mostly resemble World 6-1. 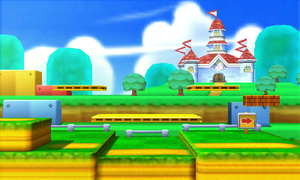 The design of the moving platform; however, is different from Super Mario 3D Land as the moving platforms in the game are moved by the player standing on a side of the platform featuring arrows. The platform would then move in that direction by the two wheels on the sides along rails. The platforms in this stage do not feature the arrows and the wheels, and its movement on the rail is not based on the player, but instead moves automatically. This area of the stage also features the Skewer stage hazards, spiked pillars that lunge in the direction they are pointing. Skewers first appeared in Super Mario World, and have returned in recent Mario games. In Super Mario 3D Land, Skewers appear in neither World 1-4 nor 6-1, but rather only in certain Airship levels, like World 3-Airship and World 6-Airship. The design of the Skewers has been retained. In this stage, Skewers lunge upward from the water below, breaking any platforms above them. Possibly due to causing lag, Skewers will not appear in online play/in For Fun mode. The stage is universally banned in all rulesets. The auto-scrolling areas of the stage provide characters with good mobility an unfair advantage because they can simply run away and camp their opponent; some parts of the stage also have walk-off blast lines. The water area has huge skewers that occasionally come up and damage the players while also destroying the platforms. 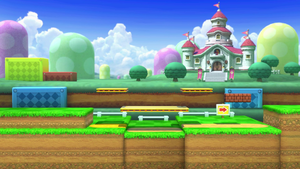 3D Land in Super Smash Bros. for Nintendo 3DS. The castle area in an earlier build. The castle area in the final game. Note the shortened red block on the left and the removal of the yellow and blue block platforms. The downhill area in an earlier build. The downhill area in the final game. Note the removal of the large chasm and the addition of the yellow platform to the right. A subsection of a horizontal area. Toad trying to protect Peach from Bowser on the stage. Bowser Jr. preparing his forward smash on the stage. Daisy and Peach in front of the castle area on the stage. Fox taunting near a tiny Jigglypuff on the stage. Male Inkling performing his down smash on the stage. Jigglypuff using Pound on Toon Link on the stage. Mario taunting in front of the castle area as seen in Ultimate. Marth dodging Ridley's fireballs on the stage. Pac-Man idling on the stage. Roy using his Counter move on the stage. Villager watering Ivysaur's bulb on the stage. Wario preparing his forward smash on the stage. Male Wii Fit Trainer using his neutral attack on Sheik on the stage. In the game files of Super Smash Bros. for Wii U, there are unused files for this level along with Mushroomy Kingdom; however, the only file remaining in each directory is the item parameter file. This is one of the five stages to not appear in demo sequences in the 3DS version. The others are Mushroomy Kingdom, Dream Land (SSB4), Flat Zone 2 and Super Mario Maker. In Super Smash Bros. for Nintendo 3DS, the Note Block changes pitch depending on which track is playing on the stage. This did not occur in Super Mario 3D Land, but rather New Super Mario Bros. 2. In Ultimate, the pitch only changes for the Super Mario Bros. 3 Medley track. A cycle through the stage without any actions that change the speed of scrolling lasts about two minutes and five seconds. If the true All-Star Mode has not been unlocked in the 3DS version of Smash 4, this stage can still appear as the 6th stage despite no Mario character appearing at the time due to Bowser Jr. being unlockable in that game. ↑ Sakurai's post on Miiverse. This page was last edited on April 17, 2019, at 02:10.